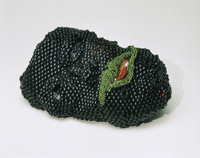 African American artist Joyce Scott is famous for her innovative use of the traditional techniques of beadwork. The jewelry and larger sculptures that she makes draw upon contemporary issues for their subject matter. The title refers to Rodney King, who, in a video-taped arrest, was beaten by Los Angeles police in 1991, insighting days of rioting in that city.